The Showstoppers’ Christmas Kids Show! 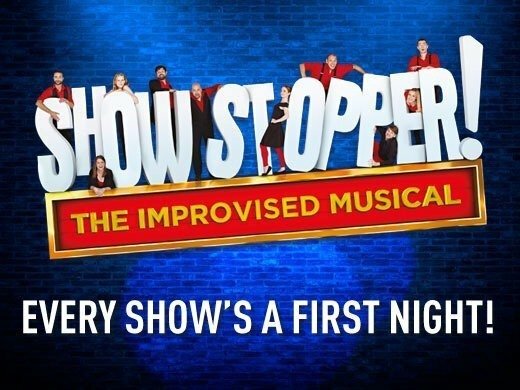 With a critically acclaimed West End run, a BBC Radio Four series and ten years of festivals and touring to their name, The Showstoppers have delighted audiences around the world with their ingenious, unique blend of comedy, musical theatre and spontaneity. Every Showstopper! performance is a hit musical waiting to happen – so don’t miss this exclusive season of exclusive Monday night performances! You will receive a confirmation email with your booking reference. If you choose collect at box office please print this and bring it with you on the day of the show a minimum of 30 minutes before the performance start time. If you choose post - tickets are sent 5 days after purchase. The performers were so clever in the way that they improvised all of the subjects that were thrown at them.for us the subject natter did not appeal and therefor became a bit monotonous for us.it is not a show that we would return to. Absolutely best night out. FIVE STARS!!!!! All the performers are AMAZING! Funny, sharp, witty. Will go and see them again. Exceptional show. Cast and musicians excellent. As the young lady who played Aphrodite said, whilst collecting with a bucket after show, for a worthwhile charity," it is organic"
Heard great things about the show but I was a bit unsure whether my 13 year old twins would enjoy it too. We all had a great time. Thanks! Thoroughly recommend this show, can’t believe how talented the cast were to have improvised everything according to audience suggestions. Will definitely be buying tickets to see this again. What a great cast of fabulous singers and wonderful musicians and what an amazing team they all are together! They know their musicals backwards and deliver a breathtaking roller coaster ride through at least 10 different genres from Porgy and Bess to Hamilton and from Avenue Q to Bodyguard all the way to Chicago. The story was funny and crazy but so is everything in a musical. Why go and see one musical when you can see 10!! I loved it and recommend it to anyone who loves musical theater! For something a little different, great for older children & adults, so quick moving and clever, throughly enjoyed it, my 14 year old daughter thought it was the best show ever!! I took my two best friends along and we had a blast! So much so that we are all going to take our partners along in January! Well done! These guys are just so talented. An incredible night, I expected nothing less. Looking forward to coming back in the new year! Fantastic show, well worth seeing this amazing talent. What a performance! How 7 people on stage can produce such an amazing show is a sign of their immense and rare talent. We did not stop laughing from the beginning to the end. Fantastic music, great humour and audience participation is a real winner. At the end of the show everyone in the audience stood up to give the cast a standing ovation - it was that good. Will definitely go to one of the next performances - cannot recommend it enough. Third time we've been - and we will continue to recommend it to others too! The quality is amazing - a truly wonderful and intelligent entertainment! They are incredible! Every show is improvised (they ask the audience and base the musical o their suggestions) so every show turns into something completely unique, definitely not to be missed! It is unlike anything I havr seen before.The actors are SO talented. I would definetly recommend seeing it! A fantastically clever and talented cast put together a musical based on audience suggestions. This was highly entertaining and would definitely go again. We did not know what to expect but were pleasantly surprised and entertained by the way a name and theme were developed from audience suggestions. The talented performers were excellent at coming up with script and songs at a moments notice. A really enjoyable experience. These tickets were a gift and this is only the second show I've ever left at half time. But then I'm not a fan of musicals anyway. All a bit too shouty and overly earnest. Wondered if some audience suggestions were from stooges - a set up. If it was all improve - then the actors spontaneity was commendable but I couldn't tell the difference between the "Out of the Woods" performance and the "Priscilla QoD" one. My niece's primary school production of The Lion King the following evening was superb by comparison! Amazing show. Absolutely perfect story, although everything was improvised. Another excellent and very funny show. Getting the audience to choose the theme, songs and title is a great idea. How the cast improvise a whole show from that is wonderful and last night's show was, as always , so excellent. I laughed from beginning to end. This team is amazing. The speed with which they prepare and deliver material is very very impressive. Great wit and quick humour. An enjoyable evening. I've seen this 4 times now and each is quite different, will try to go again! Have been to many of these shows now and everytime is so different. Always funny and entertaining. Always amazed by the talent. Highly recommend! An amazing and uplifting show. Entertainment guaranteed. A wonderful show, the energy and creativity of the performers is second to none. this is the 3rd time I have been to a Showstopper! performance, and again I was not disappointed. The performers are quite incredible, thinking on their feet and putting on a show that seems as if they have been rehearsing for weeks, when in fact it is all improvised on the night. Absolutely brilliant - can't wait for the next one! Hilarious show, voices were amazing, exceeded already high expectations. Another wonderful Show Stopper evening! The brilliant improvisers brought us side splitting humour, incredible singing and acting. Who would of thought Tescos, "Love in aisle Five"would have created such drama from this talented group of actors and musicians. Longing for our next show. An amazing show with such great talent. 101 on perfect improvisation, such a pleasure to watch and didn't stop laughing. Highly recommend! Showstoppers was such a laugh -- great fun, good songs, memorable lines and such a talented cast. The audience was always involved and the best part was that the cast were enjoying themselves too. I was recommended to see this, so I booked with my Niece who is visiting from NZ. She's in her 20's and I'm in my 50's - we both had so much fun. We laughed through out the evening and were still smiling the next day.... Superb entertainment with gifted show people. An amazing show with an amazing, talented group of performers. We laughed, we danced and were absorbed from start to finish. Will definitely see it again! Still can't get over our talented these performers are, to put together an entertaining and comical musical right before our very eyes. Hilarious, witty and thoroughly enjoyable - these guys deserve all the success and much more! The fact that the show is different every night also tempts me want to book another show! Absolutely hilarious! It's completely improvised in front of the audience! Very clever! I still have the songs stuck in my head!! To be honest I wasn't sure what to expect but I have to say it was a cracking night. Not sure how they manage it but to take a series of random suggestions from the audience and turn it into a 90 minute show is brilliant. This is a hilarious show that is unique every time. When I watched it on Monday 18tb July, it was about a Wild West brothel and the struggles of love and freebies. The show was amazing and I am looking forward to visiting it more times in the future as this was only my second time. As the show is improvisation it is different everytime and is as if you are watching a new show each time. If you want to see something different this is for you.A very clever show with real talent not a dog in sight! I went to see Showstopper, aka "Peter Panama" a month ago and loved it. I went back yesterday, eager to see how different my second improvised musical would be to the first. Last night, essentially the same cast served up a tragi-romantic-comic-drama set in a Sussex care home, entitled "These are a few of my favourite pills". It was fast paced, witty, clever - and exceptional fun. I might just go back again. A great night out. A real gamble as you've no idea what to expect or whether the show will be any good. We were really surprised and found ourselves laughing out loud a lot. Who knew that life in Ancient Rome was anything like this!